Several people have commented that it's too much like the "Keep Austin Weird" campaign of the mid-90s...especially my wife, who went to law school in Austin. I'm OK with this, but I'm also open to suggestions if anyone has a better slogan. Having lived in Texas myself, I'm all too familiar with how the KAW campaign became corrupted by all manner of people: "evil" corporations trying to make a buck, do-gooding yuppies who wanted upscale boutiques on Guadeloupe, hippie weirdos who found it fashionable to hate Wal-Mart, etc. KAW is what you make of it. KeepDurhamDifferent is intended to be a rallying cry for the independent-minded people and businesses that make this city great. We don't want to be another Cary (bland suburban), Raleigh (vanilla sprawl), or Chapel Hill (unaffordable elitism). It's what you make of it, whether as a merchant on Ninth St., a resident of Trinity Park, or a Duke student slumming it in the Dirty D Town. In case you're wondering, the second choice for the name of this site was DurhamRenowned, which I actually like better but doesn't sound pithy enough on a bumper sticker. 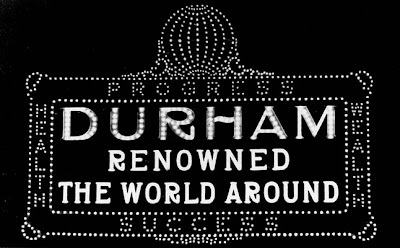 For more discussion of Durham slogans, see the post at Gary's site.